To strike with power and be effective you need to be able to generate speed and force and be able to drive it to its destination. Also you need to be able to do it without losing balance and stability or you will give your adversary the advantage. Below are five key components that will help you be a more powerful Bareknuckle Striker. 1. Move the feet from under the center of mass to quickly drive the body in the direction it needs to go. In order for you to develop the power to knock someone out quickly, you need to bring your body weight behind your punch. Footwork is the key but it must be a coordinated effort with your body mass. You must be able to move as one unit, not as fragmented parts. Both feet must be under your hips and on the ground or your punch will loose up to forty percent of its power output. Drop Stepping and Trigger Stepping, two powerful components of power punching use the drive created from footwork to generate a large amount of force. But, it must bring the body’s mass with it or your punch will not have knockout power. 2. Keep the hips low and level when moving linearly, laterally or diagonally. If your hips are moving up and down like a buoy being tossed around on rough seas, you will be wasting your strength, energy and sacrificing speed. Keeping the hips level as you move takes advantage of leverage and gravity to help increase your speed and movement. Having your hips low gives you explosive balanced energy. Your legs become compressed springs ready to explode and drive the body. 3. Be quick with your fists. Never let your fists get behind the drive of your legs, hips and torso or your punches will lack power and follow through. The fists must move in a coordinated effort with the feet and torso to be able to generate maximum power. This will speed up your strikes without losing power. This is what I call “Striking Off Your Move”, this principle is very important to use in a street fight. Remember never drag your weapons to war. Nothing is more dangerous than to throw a punch with such force that it throws you off balance and leaves you open for a counter attack. What is the use of throwing bombs that end up being duds and draining you of precious energy you can’t afford to lose? You need to develop what I call “Controlled Aggression”, to be able to control your power and not let it get away from you. Using this powerful principle will allow you to harness your power, you will be able to flow smoothly and chain your punches more effectively. Having intent with every strike and step you take is the tactic you want to cultivate for better knockout stopping power in a street fight. And if you miss, you will be able to instantly fire off another powerful strike, as you will be balanced, controlled and explosive without missing a beat. 5. Stop the power leakage. Improper fist and body alignment will contribute to power leakage in your strikes and slow you down. You will leak out power through your joints if they are not properly aligned when you throw a punch. Adjusting and aligning your structure will go a long way to developing your power when striking. So there you have it five key components to help you unleash bareknuckle power on your unlucky adversary. Using these five keys will help to unlock your potential to strike with power and destruction. It will also take you less time and energy to do what needs to be done in a dangerous situation. When violence tries to touch your life, take it out with Speed, Power and Intent using these five key components in your fight game. I'm focusing on elbows this month. In the video below I demonstrate various elbow blocking and evasion techniques. As far as blocking goes, the double elbow block is the most solid defensive technique, however, you've got to move quickly in order to get the block up. As I say in the video clip, the best tactic is to bypass the elbow and get behind your opponent. Take a look. A hot trend in the world of self defense is to re-create attack scenarios in order to make the training experience as authentic as possible. Great idea, its important to do that from time to time. However, I've found that one aspect in scenario training is almost always overlooked: your clothes. We train in order to protect ourselves and our loved ones in the off chance that a predatory individual tries to rob, abduct, murder us. But odds are high that you won't be wearing muay thai shorts or a gi when/if an attack occurs. Most likely you'll be in a parking garage after work, or in a night club and it's vital that you re comfortable fighting in office and/or semi-formal attire (even jeans). I require that all of my students train in street clothing at least one week a month. Just go to Goodwill and buy slacks, dress pants, even a blazer if its not too pricey, and keep those old wingtips you have in the back of your closet. Take one week a month out of your regular regimen to train in street clothes, it will benefit your skill set and your overall confidence in your abilities. When people get into streetfights there are always those that don’t have any business fighting in the first place. I can usually spot them a mile away, and if I can spot them you better believe the predators can too. So here is a list of the stupid mistakes that people make who don’t know how to fight. Read the list and if you find yourself doing any of these things you better get rid of them fast before your luck runs out. Remember fighting experience is something you don’t get until just after you need it. 2. Not being aware or paying attention. In the Jungle if you look like meat you will be eaten. 3. Not realizing they’re in a fight. Freezing up, talking to themselves, being in denial, not turning on, all will lead to their undoing. 4. Keeping their eyes closed or head turned away when striking. Always face the attacker, don’t rely on a lucky punch. 5. Leaving themselves open for attack. Mouths open, chin sticking out, arms out stretched too far from their head and torso, can all lead to trouble. 6. Keeping the elbows out and the fists high when striking. This will make the strikes weak and ineffective when fighting. 7. Not breathing properly when striking. Causes loss of balance and stability, also loss of power in the strikes. 8. Throwing strikes that lack power. Not throwing hard fast power punches and not having an aggressive defense will all lead to your doom. 9. Keeping the head pulled back as they fight. Allows the attacker to strike with full leverage and power. So there you have it, if you have any of these bad habits in your fight game, get rid of them now! Before it’s too late, and they’re scrapping you off the pavement or worse. Streetfighting isn’t a game, so take it seriously and train with that reality in mind. And above all don’t make these stupid mistakes, let your adversary do it. Everyday martial artists train in ritualized confrontations, complying with each other as they train. Never realizing that what they do may condition them to fail against an adversary that will not comply. They may not be able to “Turn On” or worse yet, they may freeze up due to indecision and the adrenaline rush. “Violence of Action” the intensity and full commitment of going after a target will not be present as the adversary attacks at 100% intensity. The martial artist will find that his flashy techniques and movements do not stand up against the onslaught of a committed attacker. What went wrong? In ritualized confrontations the danger or element of death is not present or does not exist. Emotion or intensity is not challenged and put to the test. Once rules and familiarity enter, the confrontation soon becomes a “Game of Skill” and not true combat training. It is not the same thing to fight for survival as it is to fight for ego based gratification set by rules which are respected by both combatants. And yet it is another thing to know the difference. All martial artists must be cognizant of the knowledge they posses and its usefulness in real combat. The traditional movements of their style long ago forgotten and used for something it may not have been intended for in actual combat, never truly tested or questioned. when fantasy and reality clash. Remember the difference between fantasy and reality is reality has bad breath and hits hard! The martial artist may find that the opponent he is facing in the street does not comply with his fighting style or he fights with 100% intensity and feels no pain. Or worse yet, the one opponent may well be many and carrying weapons. It is then that the “Foolish Illusion of Reality” hits him right square between the eyes and the school of “Hard Knocks” will be in session teaching a new student the fine art of survival. It has been said “Experience is what man calls his mistakes” and if this new student survives, he will have learned a lifetime of experience in one session. When the smell of death and uncertainty is in the air, your training will lay bare, naked for all to see. And you will know what is real and what is illusion. It is when the shackles of tradition and theory are cast off that you soon discover what it takes to survive. When this epiphany illuminates the dark and secret areas of your heart and mind and you come to know the truth. You will find that “Life and Death Conflicts” are their own entity, different from the dojo and the ring. What you do with this knowledge is up to you, but know this, you will never be the same again. You will possess what every warrior before you has known for centuries, “You are Mortal” and the illusion of invincibility will not be there. So train hard, intensely and most of all truthfully and never fall for the complacency of ritual. If you are within range to throw an elbow then you are within range of getting hit with an elbow. Being that close, your cover is as vital as your strike. trust me, it hurts a lot when you're hit with an elbow. Watch the short demo clip I put together to demonstrate an old style muay thai elbow strike with proper cover. 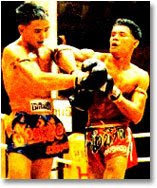 There are three key differences between the modern 'ring style' muay thai round kick and the old style, military muay thai round kick: the lean, the target and the bio mechanics. Ring style fighters tend to stand upright, back leg flat - old style requires the fighter's stance to remain leaning forward, which translates into every strike. In the ring, the goal is to score points or get the knock out, so kicks are aimed at the center of the thigh or thrown up high to the head. Never throw a high kick in the street, you're more likely than not to either slip or get caught. Ledrit and muay baron kicks are aimed lower towards the knee. In combat you won't lose a point for blowing you your opponent's knee, you survive. Thirdly, the bio mechanics between the two are completely different. I trained at a ring style school in Seoul and having never seen my style of kicks before, they continually tried to correct me.